Now that The Simpsons has done its first episode and Christmas special in just one airing, it’s time for us to move on to the next episode and see what the Simpson family looks like without the holiday season. 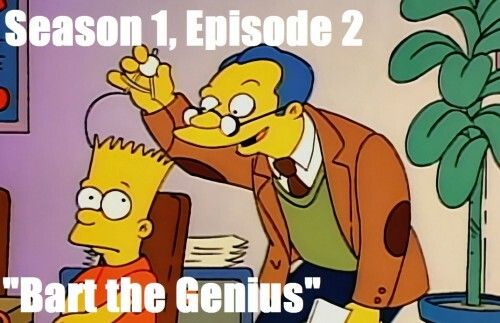 “Bart the Genius” aired on January 14th, 1990, being the second episode written for the series and the second to air on television. As I mentioned in the last episode, the episode titled “Some Enchanted Evening,” was written before this episode, but due to the crude nature of the animation, it was pushed to the end of the season instead (with not much improvement in between). The Christmas special was written later and pushed up in the airing order to release it during the holiday season. This was also the first episode of the show to air in the 1990s, bringing the start to what will be known as the golden decade of The Simpsons. Will this episode be a benchmark of greatness with more greatness to come? Or did it come up short? We’ll find out very soon. But first, It’s also worth mentioning that this the first episode to feature the classic opening sequence that the show is known for, also being the debut for the famous “chalkboard gag” and “couch gag.” The chalkboard gag is shown at the very beginning of the sequence and features Bart writing a phrase on the chalkboard numerous times as a punishment. These phrases are usually comical in nature and some are downright silly in the sense that Bart actually got in trouble for doing something incredibly outrageous and outlandish. The phrases change from episode to episode and from my knowledge, a chalkboard gag has never been done twice (I could be wrong though). The couch gag is generally a little more interesting, being shown at the end of the sequence. They usually show the entire Simpson family coming in the house to sit down on the couch (or try to) with something unique happening during the process; usually to a comical degree. It’s not uncommon to see a certain couch gag used in multiple episodes. In fact, certain couch gags are reused and brought back due to their length because if an episode runs shorter than the episode run time, they may use a certain couch gag to make the episode air time a little bit longer to compensate for the shorter run time. It’s also worth pointng out that the first season had a unique opening compared to the one used for Season 2 through Season 20. While the premise is pretty much the same and has a similar flow, there were a few scenes in the first season intro that were cut shorter and the animation was in general improved for future iterations. The “highlights” of this first season intro is a section where we see a bunch of unnamed adult characters running to chase a bus (caused by Bart stealing the “Bus Stop” sign), and a slightly extended scene of Lisa biking home to the Simpson house. Aside from those features, the animation improving, and the inclusion of more permanent Simpson characters, there really isn’t too much different. I do like the improved intro more, but it is always fun to go back and take a look at what the intro used to be. Anyway, I know I’m talking a lot about the intro and not really about the second episode yet, but I think it is important to take a look at this now while it’s relevant because the opening sequence of the Simpsons is pretty iconic. It’ll be around for the long haul and it introduces (almost) every single episode of the show. And a show with over 600 episodes; I think that’s very important. So for every episode, I’ll try to mention and highlight the chalkboard gag and couch gag in the Introduction before I get to the actual episode. For this episode, the chalkboard gag is “I will not waste chalk,” which is pretty funny considering the circumstances of Bart’s punishment. The couch gag shows the entire family trying to crowd onto the couch with Bart getting launched to the ceiling when the combined forces of the entire family cannot fit them all on one piece of furniture. 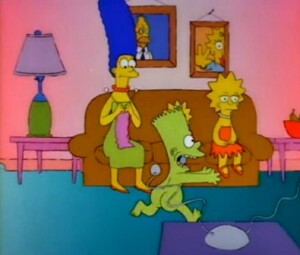 And as an added bonus for the continuation of this couch gag, when the camera focuses on the TV and the writing credits for the show, Bart can be seen falling to the ground in front of the TV with a loud thud. 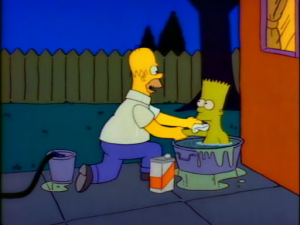 In the first episode, we got a few glimpses of the kind of child that Bart Simpson is. Unlike his sister Lisa, Bart is a bit more outspoken and is more prone to getting into mischief, disobeying his parents wishes, and is not the sharpest tool in the shed when it comes to his schoolwork. This episode really hits that point hard when one of Bart’s stunts miraculously puts him on the other side of that coin; in an environment that he’s not used to, and in a place where he probably doesn’t belong. How long can Bart keep the charade up, and how far is he willing to go before he gets caught or before the guilt catches up with him? The episode starts with the Simpson family playing a nice game of Scrabble. We find out that the reason for this family game night is because Bart is scheduled to have a big intelligence test the following day and the game was a way to get Bart’s brain working before the big exam. 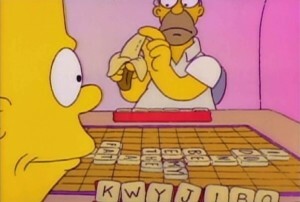 Instead of taking the exercise to heart, Bart spends the game mouthing off and making up words, leading to Homer chasing him through the house when trying to pass off “kwyjibo” as a serious word. Bart continues his escapades into the next morning when he gets caught defacing school property with spray paint and gets into verbal scuffles with fellow honor student and teacher’s pet Martin Prince. After a few choice words and tongue-faces from his rival, Bart decides to get his revenge on the boy by taking Martin’s finished exam and swapping the names on the two exams when nobody was looking. Later that day, Homer and Marge come in for Bart’s punishment for defacing school property,and while Principal Skinner is lecturing the two parents on Bart’s behavior, the school’s psychologist, Dr. Pryor, comes in to reveal that Bart has a 216 IQ and is classified as a genius. 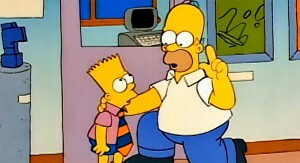 This comes as a shock for the entire room, but Dr. Pryor suggests that Bart’s behavior may be the result of him feeling suffocated in the public school environment and suggests they move him to a private school where Bart can learn at his own pace and set his own boundaries and assignments. The thought of no boundaries and no homework assignments pleases Bart and he accepts the offer without question. During his first few days of private school, Bart starts to feel incredibly out of place. The lessons are extremely advanced and the other kids are very aware that Bart is not as smart as they are; teasing him and taking advantage of Bart’s actual intelligence. To make things worse, Bart’s friends at his old school will no longer talk to him anymore because he is now a brainiac himself, making Bart feel even more like an outsider. Even Marge tries to nurture her son’s newfound intelligence by taking the family to the opera and experimenting with different forms of culture, but as we discover, these are things completely out of the Simpson family’s element. The one thing that does improve with his new life is the relationship Bart has with Homer, who tries to encourage and positively reinforce his son, without being the loud and obnoxious authority figure he normally is. This new attitude of Homer’s convinces Bart to stick with the act for a bit longer, even though it is painfully eating at him. On the next day of school, Bart has an accident in chemistry class which causes the entire room to explode in a giant mess of green goo. Bart is sent to talk to Dr. Pryor about the incident, where he reveals that he wants to go back to his old school and classroom as the new set-up is not working for him. He disguises his intentions to move back to the old class by claiming he wants to investigate the behavioral patterns of kids at public schools, but when writing his proposal, Bart decides that keeping up the act will no longer work because he is not smart enough for this kind of study and decides to write a confession letter instead, explaining how he cheated on the intelligence test. This will more than likely be the case for the rest of the Season 1 episodes, but for this episode, I had not seen it until it came out on DVD much later on in the early 2000s. Although I was alive when this episode and Season 1 was on the air, I did not have much of a memory of the show until it got to Season 2. After all, when Season 2 came around, I was at least 3 years old by that point. However, like most of Season 1, it was definitely an interesting experience going back to this first season and seeing how the show used to be. Even though the animation was weirder and characters seemed to act or look different than what they were supposed to be, as a Simpsons scholar, it was good to get that much needed history lesson. I have to say, Bart has quite the audacity for looking his father straight in the eye, and calling him a big, dumb, balding ape, and that’s pretty much what he does in the first few moments of the episode when giving his official definition for what a “Kwyjibo” is. I think it’s a a pretty iconic moment of not only this episode, but also for the season and series as a whole. It shows the kind of relationship that Bart and Homer have for not only the early parts of this episode, but also for the entire series moving forward, and it also makes their bonding in this episode even more special. I also really like Lisa’s line at the very end of the episode as well, the one about Bart being stupid again. I think it works very well because throughout the entire episode, Lisa was skeptical and doubtful of Bart’s intelligence results and she made that doubt incredibly clear. So at the end of the episode, when things return to normal, Lisa isn’t at all surprised by the newest development of Bart not being a genius. She let the big change run its course and is ready for the next adventure to unfold at the end of the day/episode. I think this is why I like Lisa so much as a character, just because she isn’t just the voice of reason, but she’s also very aware of what’s going on around her and she often makes it a point to have a little fun and still be a child at the end of the day. Another line I really enjoy from this episode is when Homer tells Bart, “Don’t worry son, I bet Einstein turned himself all sorts of colors before he invented the light bulb.” I like this saying because it’s a funny line and it’s also incredibly true and very wise words coming from Homer. Sure, Bart was faking his intelligence the entire time and Einstein was an incredibly smart man, but isn’t the best form of intelligence, “learning from your mistakes?” We get wiser and smarter the more mistakes we make because we know how to not make them again, and with all things considered, that was just a really good and inspiring thing to tell his son and I really appreciated that when watching this episode back. Although not really a funny or favorite moment of mine, I also think the opera scene of this episode is very important. This scene shows the Simpson family at the opera with Homer and Bart making wise cracks and inappropriate noises during the entirety of the performance. While embarrassing to Marge, I think this is a golden moment for the family because it really shows the type of family they are. They aren’t used to high-class entertainment or being quiet during a show or sitting still. They’d rather be going out for burgers or frosty chocolate milkshakes and sitting around the family room watching television. Even Lisa, who is very much into the performing arts can laugh and snicker at Homer and Bart’s antics. I think it’s good that they show this family dynamic early because it perfectly personifies what I think is the prime example of the typical American family. For years we have been taught how to act or how we display good manners, or what is acceptable forms of entertainment, but at the core of it all, families (and people in general) have their ways and have their unique identities, and those lessons are just going to go to waste or fall on deaf ears. So when the Simpson family goes to the opera, they aren’t going to think, “wow, the vocal range on this group of performers is impressive,” they’re going to think, “how much longer is this going to be?” Every family is different, and you can’t expect them to act in a certain way or enjoy the same things as other families. They are going to do their thing and act in their own way, and rightfully they should. This is something that will be further looked at and developed in the episode “There’s No Disgrace Like Home,” so I’ll definitely come back to this topic later in the season, but for now, it was nice to see the family out of their element to get a further understanding of who they are (especially this early in the series). I have to admit, I actually kind of enjoyed rewatching this episode and taking notes from it. It’s interesting how when looking at something you love from an analytical side of things, your perspective kind of changes a bit and start looking at things in different ways. Truth be told, before doing this analysis, I wasn’t really a big fan of this episode. I don’t think it’s bad or unwatchable or anything like that, it just lacks a lot of substance because it does fall in the show’s first season when things aren’t as established and the writers are focused on setting up characters and plot lines for the show’s future as well as the present. It’s a pretty typical storyline though; bad kid gets away with something, he starts to bask in his success, but then he feels guilt, and in the last moments is either caught or does the right thing and comes clean. Many shows, both animated and non-animated, have done this story before and for what it’s worth, the Simpsons do a pretty decent job with it. I particularly enjoyed the growing relationship between Bart and Homer and how the only good thing to come out of Bart’s actions was them growing closer. It definitely hit a spot that I had overlooked for many, many years. On the opposite side of the coin, I also found the episode to be a little unfinished in a few respects. One thing that kind of bothered me on this rewatch was how easy Bart was able to get out of the situation without any sort of punishment (that we know of). Yeah, Homer angrily chased him around the house, and in theory, the schools may have given him punishment later on, but as far as we know, Bart pretty much got off scot-free here. It’s one of those things that’s not really a negative, but it’s something I would have liked to have seen if the episode time went on longer, or if they cut out some of the other parts of the episode that could be seen as padding. Speaking of which…what even happened to Martin Prince after the exam? Wouldn’t the psychologist notice that an honor student got a really low and uncharacteristic score? Wouldn’t that raise some questions? And aside from the random shot of him and his family at the opera, he’s not even in the episode anymore after the test scene. And for being the person who got swapped with Bart, wouldn’t he be the one with the most to lose from this escapade? And finally, it always struck me as odd that Bart’s old friends treated him badly when he visited his old school. I always thought it should have been a case where maybe his friends were off doing something and Bart couldn’t come because he had a conflict with his new life and that would make him depressed as opposed to his friends just being mean. It just seemed like an odd choice. But yeah, I can’t really classify those things as negatives, they’re just things I thought about on my most recent watch. At the end of the day, I was honestly surprised by how much fun it was to watch this episode again. I wouldn’t say it’s top tier or high quality Simpsons viewing, but for a first season episode, I think it accomplishes what it set out to accomplish, which is all that needs to be said really. The’re still plenty of Season 1 episodes left; some I’m looking forward to and others not so much. But until then, remember folks; cheating on intelligence tests will only take you so far, so don’t do it! Hey guys! You have just read my second episode retrospective. I do apologize for the extreme lateness of this entry, but I’ve been dealing with a lot of things going on in my personal life as you may have read about on my Twitter account or heard on my Youtube channel. Long story short, I went on vacation, got sick when I returned, and had my computer break down when I recovered. Because of this, it took me awhile before I could continue on with this series and for that, I apologize. I’m hoping I can get the next episode ready by the end of next week. Like I said in this entry, I had a lot of fun working on this second episode, so maybe that will give me some more motivation moving forward. I’m still trying to get used to this and am still playing with the format, so there may be some changes in future episodes, but for now, I think I’m going to leave this one at a close.